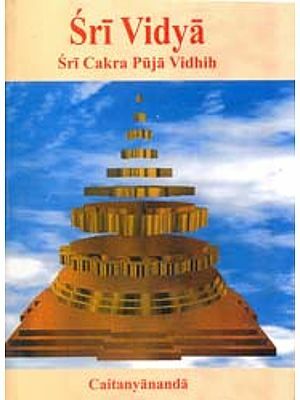 This book was originally published in 1992 by Chinmaya Mission San Jose to commemorate the first Chinmaya Summer Day Camp held at Sandipany San Jose California. At the camp, the renouned Vedic Scholar Pandit Ravichandran Iyer taught Puja Vidhi to young children which was very much appreciated by all. In this Indian Edition, diacritical marks have been added wherever necessary. Non-English words have been italicised. This will help readers to identify and pronounce the words correctly. The English plural sign 's' has been added to untranslated Samskrta words after a hypen(-) to show that it is not elemental to the words e.g. Mantra-s, Veda-s, Rsi-s etc. Lord Ganesa is the elder son of Lord Siva and is sometimes called Vinayaka, the Supreme Leader. He is also known as Ganapati, the Lord of the ganas. He is called by yet another name, Vighnesvara, the Lord of Obstacles. These names indicate to us that He is the master of circumstances and even the divine forces cannot obstruct His path. This is why all Hindu rituals and auspicious acts are never undertaken without invoking Him first. It is believed that with His grace, all disturbances that arise from within us and outside of us can be overcome. Ganesa has a unique form. He has an elephant's physical features, such as the head, the ears, the tusks, and the trunk. But He also has some human physical features, such as hands and legs. His form represents ideas that teach us about God. Ganesa is the symbol of knowledge. Head: To hold all the knowledge that is to be known, He has a head as large as that of an elephant. Ears: Listening to the scriptures and other forms of knowledge is the first step to learning. Hence the large ears like that of an elephant. Trunk: We use the knowledge we have gained to discriminate between right and wrong, good and bad. The elephant's trunk is used to lift heavy objects or a fine blade of grass. Our intellect should be made so efficient that we can solve great problems in our life and also come to understand and know God. Tusks: One tusk is broken and the other is whole. This is to show us that even though we must discriminate between good and evil, we must also outgrow pairs of opposites like heat and cold, respect and insult, honor and dishonor. Mouse: The mouse represents our desire. Even a desire as small as a mouse can destroy us completely if it is not kept in our control. The mouse does not eat all the food placed before the Lord without His permission. Whenever the Lord decided to go to anyplace to serve His devotees, He uses the mouse as His vehicle. Likewise, we should learn to use our desires for the benefit of others as our service to the community. Ganesa is sometimes depicted with four hands. With one hand He holds a rope and pulls us towards Him. In His second hand He holds and axe which He uses to cut off our harmful desires. In His third hand He holds a modak (sweet rice ball) to reward us when we reach Him. With His fourth hand He blesses His devotees. In the main puja or worship, of the temple deity, there are 16 steps to be followed. Lord Ganesa is invoked to remove all obstacles that come in our way, and for the successful completion of the puja, one must begin with an invocation to Lord Ganesa. Following this are prayers to Goddess Sarasvati and to the Guru, followed by the Kalasa-puja, or sanctification of the water, the Dravya-puja, consecration of the materials to be offered to the Lord. An Atma-puja is also done for the purification of one's own self. At this time you will see the priest putting a flower on his own head! After these initial procedures, we begin the Sodasa-Upacara Puja, the sixteen steps. Many of these formalities are ordinary services we perform daily to our own body. For instance, when a guest comes to our house, we welcome him first, give him a place to sit, an opportunity to take a bath, and then we offer him food and entertainment. When we bid him farewell at the end, we do so only with the promise that he will come to visit us again. In this puja, It is the Lord Himself whom we are welcoming as our guest, and this welcome is in the form of a prayer, called avahanam. The deity is then offered a seat, asanam, water is given for the washing of His feet, padyam, and hands, arghyam. He is offered water to drink, acamaniyam. After this, the deity is bathed, snanam. After the bath, fresh clothes are offered to the deity, vastram, and He is decorated with scented sandalwood paste, candan and kumkum. The deity is decorated with new ornaments and a flower garland, puspamala, and offered incense, dhupa, a lamp, dipa, and freshly cooked food, naivedyam. The last step is the arati in which camphor, karpura, is lit up in front of the deity, in the light of which one sees the Lord's form. When we put our hands over the flame and then touch our own eye, it means that we will now try to keep that light or vision of the Lord ever in front of our eyes and look upon the world from this new divine standpoint. The food that has been offered to the Lord becomes prasad, blessed food, and our partaking of this prasad really indicates ananda-santi, the blissful peace that we experience upon realization of God. In puja-s conducted outside of the temple, there is also a concluding "farewell" prayer to the deity, but this is not done in the temple puja Because the temple is considered to be the Lord's permanent abode. Can I keep Ganesh statue in the house for all the 10 days without immersing on the last day . Kindly send me the Viddhi Puja for the Lord of Wisdom. may i know how the pooja is conducted at home? 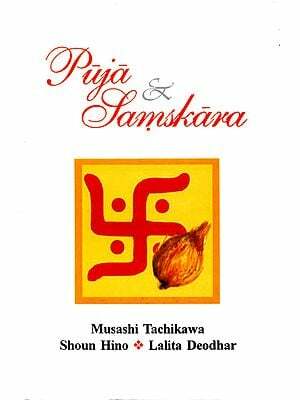 I would be grateful to have a review of this book on Lord Ganesha Puja. Please submit to me the method of performing ganesh puja.